What? Monday again? Last week flew by and before I knew it, it was the weekend. Now another week is beginning and October is passing in a flash. Can you believe Halloween is just around the corner? My awesome MIL made Cameron's costume -- a monkey suit -- and he is ready to roll. 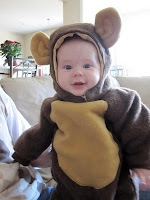 My little monkey. Let the photo ops begin! Alicia Keys gave birth to a baby boy, Egypt Daoud Dean, on October 14th. Egypt is her first child with husband Swizz "Kaseem Dean" Beatz (Yes, I typed that correctly). Congrats Alicia!!! That lucky kid is getting free concerts with every lullabye! Neal Patrick Harris and his partner David Burtka welcomed twins Gideon Scott and Harper Grace on October 12th. Congratulations guys!!! Last week I caught up on Sister Wives and Christine (Wife #3) had her 6th baby, Truly Grace. The Browns were also featured on Oprah -- and as intrigued as Oprah seemed with their lifestyle, she really didn't ask very many good questions. A little disappointing. The topic of the investigation and possible prosecution for bigamy did arise and Kody Brown admitted to really not expecting anything like this to happen when he signed on for the show. I don't know how he couldn't have at least acknowledged that possibility... I don't necessarily agree with the enforcing the bigamy statute against this family, but the family is throwing it authorities faces by having a reality show about it. I have Sister Wives on my DVR to watch from last night and I have more shows to catch up on...I haven't even touched on Teen Mom from last week because it was such a hot mess that I need to devote an entire post to just that show and it's "recap show" that is airing this week. I can't wait to see how Catelynn's mom reacts when Dr. Drew calls her abusive. Awesome.